I drove down the A22 to Hastings last Thursday for a lunch meeting with wonderful Paul Saxby from Arcade Fisheries to discuss the Fish Day we are going to be running at May’s Penshurst Farmers’ Market. So much for a trip to the seaside – it was mizzly, grey and totally foul but despite the weather, the trip was pure heaven. For not only is Paul great company but he took me to a very special restaurant, St Clements, where chef Nick Hales cooked the brill Paul had delivered that morning in an exemplary fashion. I’ll be writing about Hastings fish and fishmongers here when I get back from Nepal in April, with more on the format of what we will be doing at Penshurst together but today I wanted to write up the meal we ate before I forget the detail. I buy Paul’s superb fish regularly at the market so know its quality well, and it was a treat to have it cooked for me by a chef with such a confident touch. The restaurant was quiet on such a miserable day but the pleasant room and quietly efficient service created a relaxing environment to chat and eat in. Chef Nick bought out bowls of a Spanish style clam soup thickened with rice for us to try (delicious and I must try a home version) before I ate scallops (also from Paul) cooked Thai style with soy, chilli, ginger and chopped coriander. 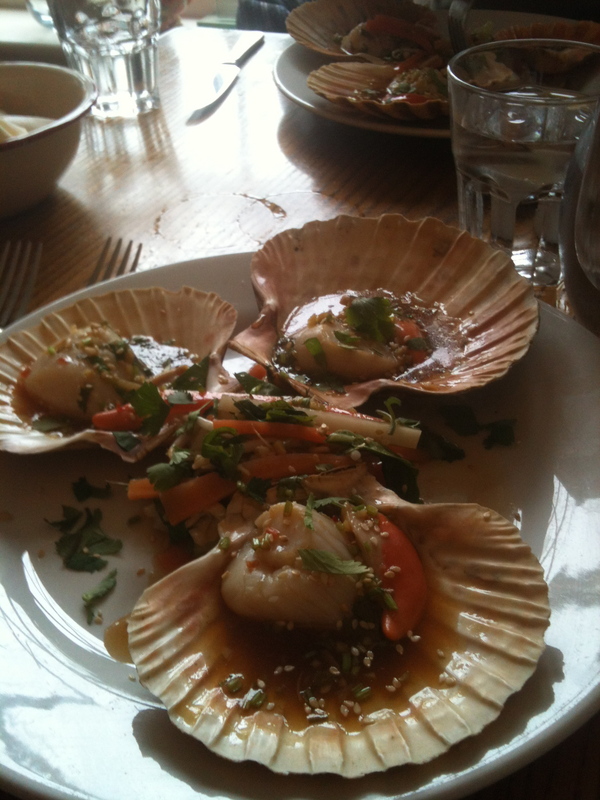 The scallops were just done and still translucent in the centre, and tasted sweet and pure. Our main course was the aforementioned brill. It’s a fish I’ve only recently been introduced to – yes, again by Paul – and when I cooked it at home it lived up to its name very satisfactorily. But this was different again – a fat, meaty slab of white fish with that almost bouncy texture that goes with fresh fish in the best condition. 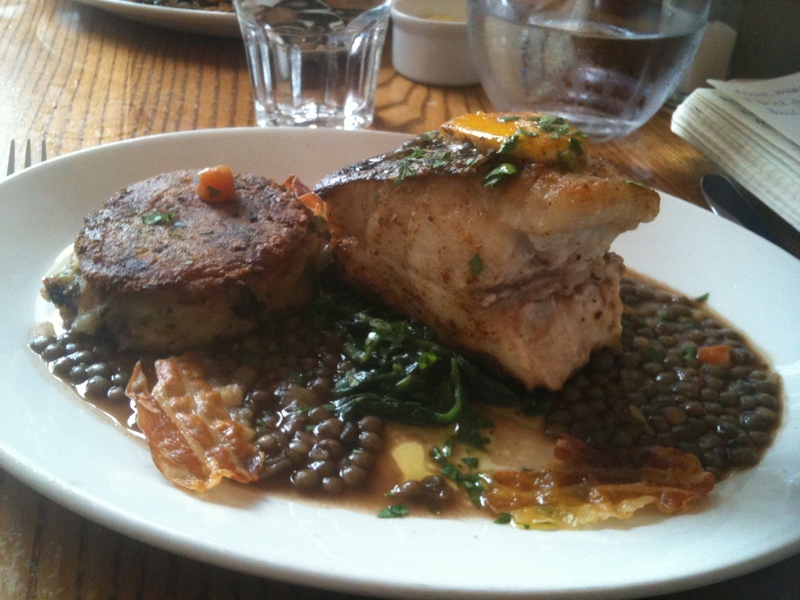 It came with a fried cake of bubble and squeak, lentils and very thinly cut crispy bacon. It was completely satisfying. 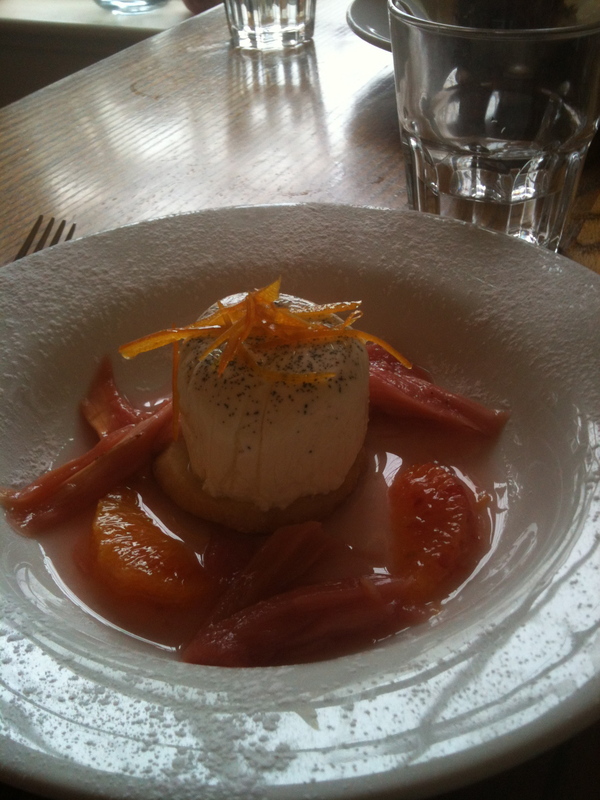 After all this great fish, luckily my pudding tummy still had room, thank goodness, for vanilla pannacotta with Yorkshire rhubarb, blood orange and shortbread though I did covet Paul’s Seville marmalade orange pudding served with a great custard. Three courses plus a fish soup at lunch is quite a meal but i drove north from Hastings in the continuing rain happy and not overfull. I can’t wait to go back and hope for sunshine so I can explore more of the town. This entry was posted in Eating out and tagged fish, Hastings, restaurant, restaurants, review, st clements. Bookmark the permalink.